Make sure your USB Type-C devices are always fully charged and synced with the USB Type-C Male To USB 3.0 Male Cable. You can use this cable with a USB wall charger or through your desktop or laptop. 1m length. Excellent small USB cable. Perfect for charging on the car or transfer data to a laptop. The product arrived swiftly and all was good. Unfortunately the USB c cable that I purchased wasn't connecting properly and wouldn't charge, so in terms of first impressions not great. However the customer services have been very helpful and have sent me a replacement out within 48hours which is good. Well see when the new one arrives if it's any good. I had issues with connecting my phone via Android Auto to my car until I tried this cable. All the different cables I've tried in the past, including the original factory supplied cable for my phone, Android Auto would randomly disconnect so I decided to purchase this cable and it seems to have fixed the issue. 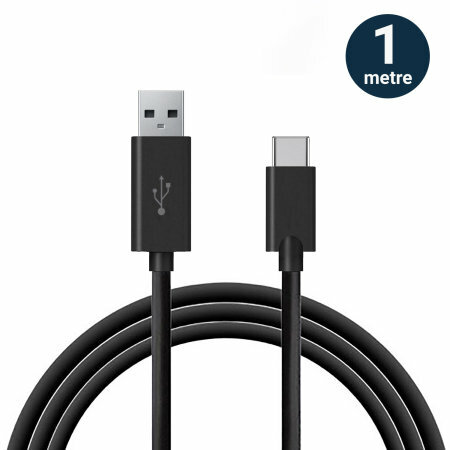 Although expensive, I'm guessing the Olixar short 10cm USB Type C cable must to be manufactured to a much higher standard than all other cables that I've tried (the short length may also be reducing signal loss?) so it was able to provide a better connection to my car via Android Auto. A Good câble length that is idéal when your using your device while charging. Strong, flexible and of sufficient length to fulfil all my requirements. The length. What job the cable is capable of doing and reviews on reliability. The cable itself is all right. Good for money. The customer service is always good and responsive. A perfect selection of cables. From the short handbag charger to the under desk socket long cable every cable I need for my phone in one pack. Quick delivery, smooth transaction, thanks! Very sturdy cable, may be a bit on the stiff side for some. But I like it and it's a good length, so it can reach across the sofa. Delivery was super fast. This is a well made product. Not all cables are the same and this truly shows the difference. Very useful for having extra chargers where they are needed. Excellent cable. Really does allow USB3.0/USB-C transfer speeds. I bought this not as a charging cable but to allow the really fast transfer speeds you can now get with USB3/USB-C small SDD - and it really does deliver. Always a good investment to buy a longer cable so you can roll over when charging, might get a USB-C extender and buy another 2m cable for longer distance to my bed! The cable itself is very thick and sturdy and i dont see it breaking anytime soon. Excellent cables, thick and beefy. All lengths are useful, charge quickly, and so far seem very robust. The cables were exactly as described and just what I wanted. Very quick delivery as well. When the cable arrived it was well packaged, which I have found to usually be a sign of a good quality product. The cable seems to be well put together, with strong terminations and plenty of shielding. I tried it with my Nokia Lumia phone (yes, there are still a few of them out there!) and it worked perfectly. I was expecting USB C and micro USB! it ain't! It's USB C and something else which does NOT fit micro USB!! The workmanship of the cable looks good. They feel to be of a good quality. I trust the content of the information on the product. Second purchase of this product from this site. Only required as I broke the first cable through carelessness, had that over a year. Would highly recommend. Initial thoughts as only received today! Seems well made but no long-term assessment available. USB 3.0 type-A (normal one for computers & laptop) at one end. USB type-C (reversible) at the other. 2m cable (i.e. typically double the length or more of cables you would get with your mobile phone). No more annoying Windows "...you can transfer faster if you use a superspeed USB 3 port". Note the blue connector colour – you must have similar port on your computer to get the speed benefit of the cable. USB-C connector feels a little tight on removal but inserts fine. So, approx 3 times the speed. Happy with this. I'd imagine theoretical cable transfer to be 5Gbps (due to being USB 3.0). Transfer test almost certainly bottlenecked by HDD. So far the products are working great! Work as it's supposed to! Was looking for a second charging cable for my Huawei P9 to use at work and searched several places. Came across this website as this was recommended for my phone, read the reviews and took a chance as I thought it was reasonably priced for its purpose. So glad I did!!!! As I was skeptical about buying from random sellers on another site. If all you're looking for is a charging cable, I would recommend buying from here. Been using it for two weeks thus far and it does exactly what it's suppose to do. I will be coming back to this site if I need to replace my original phone cable, or anything else! So far, so good and over a score less than the official AKG resellers wanted to charge. The jack fits into the headphone socket well AND can be removed with relative ease, should you wish to. Love these. They work well and have lasted several months now. We've had problems with our cats chewing through plastic cords and so far (knock on wood) these had survived. No issues to date. Great standard product, charges when plugged in eg. no fiddling with cord required. all the information was there as far as features. the only information is standard shipping takes a little longer than expected. I guess international takes longer for shipping. Very good high quality and long charging lead for all your equipment that now uses the newer Type C socket. Would highly recommend, I am buying another. Fast delivery, products are to a high quality and great value for money. Just the product I had been looking for! Recently upgraded my phone to a Samsung A3 (2017) and found that my power pack connection did not fit.Finding this product was a godsend as it means I do not have to spend money on replacing the power pack. Delivery time was superb. It arrived within two days. Thank you. Very well made and the cables are strong and thick and I am sure they will last a lifetime..... but they don't have to do they? They only need to last until the next version of usb connector they come up with because then I'll have to buy some new ones won't I.
just what I needed, quick delivery. Very happy, thanks. I was looking for multiple cables and this was the best value option. Item was exactly what was needed. Description was exact and product works as expected. Perhaps a longer item could be sourced say half as long again as there is no intermediate lengths available. Either short 10cm or over 1m. No worries with LG G6 and power bank. Quality item exactly as described. Well packaged and despatched promptly. I was looking at buying a handful of 'cheap and nasty' cables of different sizes off eBay but I am so glad I stumbled across these. I can assure you they are of excellent quality, work perfectly with fast charging and feel durable and long-lasting. Definitely would recommend for anyone wanting high quality cables in varying lengths, you will not find any that are better value for money than this set. Bought these to charge BlackBerry DTEK60. They do the job perfectly. Good value and excellent service. We just purchased new phones and needed the new type C cords and adapters. This package is a great starter kit. All of the components work flawlessly with our new phones. Thank you for making it so easy to transition from micro usb to type C connections. We would recommend you to all our friends and family. More useful than the shorter lead provided with the phone and is compatible with the phones fast charge function. However, the USB-C connection plug seems to be very slightly bigger than the original Samsung unit, which means that it is just a little more difficult to push it into the phones socket when the phone is protected in a lehter case which has a silicone insert to hold the phone in place. Good cable for keeping in your pocket or bag for charging on the go. Works perfect. Prompt dispatch and delivery, at very competitive prices. Recommended. I bought these for myself a little while back when we ordered our new phones. My husband waited until he actually got his phone to start looking for new cords. He liked mine so much he asked me to order him a starter kit too. They are great cords. The adapters work great. A nice way to transition from micro use to Type C cords. A great buy!!! Says what it does on the tin! The LG V 20 is not sold in the UK. Needed extra charging cables asap as spares for the office, home, car etc... Not an item one can easily buy on the High Street.... A very practical set. Arrived quickly. All good quality. MobileFun sent a good product in a timely manner; They do what they say on the tin - as one famous company used to advertise!!! I just bought a new Samsung S8 Plus. I needed new cords for it. This set is perfect for changing over my micro usb cords (it comes with adapters) as well as quality new cords. I tried them all out and they all work perfectly. I will definitely buy another set if I need one. A great buy. There is nothing I didn't like about them. Bought as an additional charging cable to the supplied version. Charges at fast speed, a metre is a usable length around the home & price was good. So far so good. Long durable cord perfect for using while charging. I was pretty exited when this arrived today. The 2m cable is perfect for the main phone charger plugged in under my bed, and easily reaches the bedside table. One 1m cable is stored with the USB multi-charger that I take away with me, along with a lightning cable for my wife's iPhone, a micro-USB cable for my camera, and whatever that weird FitBit charging cable is. The other 1m cable is in my laptop bag, for charging and/or file transfers. The 10cm cable is in my messenger bag, with a power pack that only came with micro USB, for charging on the go. They all seem solid and well made, and are USB-C compliance tested and certified, which is great. One thing: I expected this to be an official Olixar multi-pack with four cables in it, but it seems to be four separate cables, each in it's own zip-lock bag, just shipped together. Still, buying the "Multi-length USB-C charging cable 4 pack" saved just under 33% on the price of buying the same four cables separately, so no complaints. I'm very impressed with the quality and was hoppy to see it had been properly certified. I ordered this to have a cable at work to charge my phone from my computer, and I have to say that it is perfect for the job as the cable is really quite sturdy and is perfect for the job, another great quality product. Highly recommended. Exactly what I wanted. Long charger for my huawei phone. This cable seems to be pretty good quality. It is thick and feels solidly built. The USB A connector that goes into the computer is quite long in comparison to e.g. a standard apple charge cable, but also seems quite well built. Item ordered and delivered promptly from Mobile fun, as always a very good service. This pack contains four cables a short cable for battery pack to phone, 2 'standard' 1 mtr cables for general use and a 2 mtr cable for those that fit cradle and charger permanently into your vehicle or remote charge. Excellent idea, perfect for a one of purchase to fit all situations, goods as described and of good quality. Saves loads of time and separate purchases elsewhere. A perfect all rounder solves all situations in one go. Highly recommended. I have ordered parts from MobileZap before, with both products being delivered in a timely manner. The ordering process was quick and easy, hassle free, delivered promptly. Very helpful website and good communication, well priced. I would definitely recommend them . Cables are of good quality, and as described. Good cost for sturdy, simple cables that work as advertised. Recently purchased new phone with the new USB-C connection port. I needed to replace all my charging cables. I found Mobilefun online who have a great range of mobile products. This is a cracking cable for fast-charging your phone. So good in fact I bought another the next day. Good product quality and fast delivery. Happy with this purchase. Cable does we exactly what you need it to do. Customer service was awesome. Very happy..."
This is one of the cheapest type c cable bundle I could find online. Surprisingly it was well made. Highly recommend for those who just bought note 7. Fits perfectly and it's length is perfect. Can always do with a longer charge cable and this one I would say does the job well. Charges at rapid rate (assuming the power source is appropriate), feels solid and not easily broken. Nice cable. Received promptly and works perfectly. Great service, will use your company again without hesitation!! Cable does we exactly what you need it to do. Customer service was awesome. Didn't receive my first cable (lost in post) but they replied to my query straight away and sorted me out another one express delivery. Very happy with Mobile Fun and would use again. Great product. Good quality, two year warranty. Arrived on time, thanks MobileZap!